The barbecue is free and open to the public. Constituents are encouraged to come with their questions about state issues. 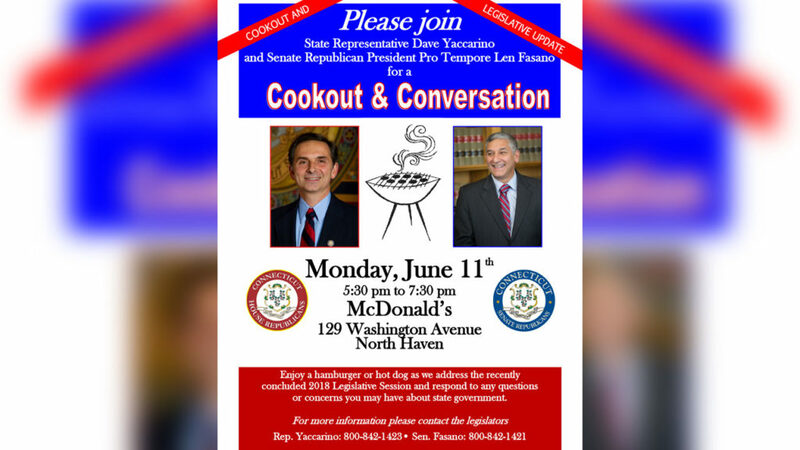 State Senator Len Fasano and State Representative Dave Yaccarino will host a barbecue and post-session legislative update in North Haven on Monday June 11, 2018 from 5:30 pm – 7:30 pm. The event will take place outside the McDonalds located at 129 Washington Avenue, North Haven. The barbecue is free and open to the public. Constituents are encouraged to come with their questions about state issues. Attendees will be able to meet with both Sen. Fasano and Rep. Yaccarino to discuss the 2018 legislative session.